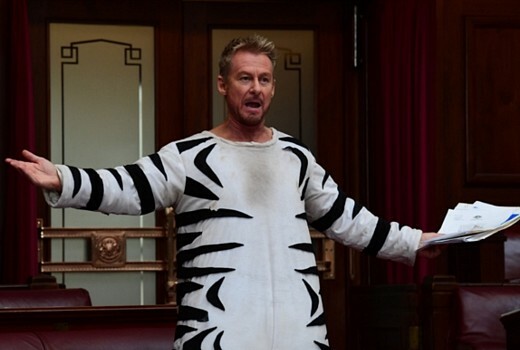 Rake returned with 715,000 viewers in August, this week at 505,000. It recently pulled another 116,000 in Timeshifted viewing, the highest number for a Sunday show. But for those who are not warming to the new universe in which Cleaver Greene finds himself, Duncan is pragmatic. “There are a lot of people who want the same thing, and I get that. I understand why they want things to be predictable. But my job is not to do that. My job is to create interesting television. “Where we were going with Rake, certainly by the end of season 4, was pretty bloody interesting. Scripts are also art-imitating-life, with senators recently voted into Canberra on the slimmest of margins and another leadership-change -all reflected in current episodes despite being penned over 12 months ago. 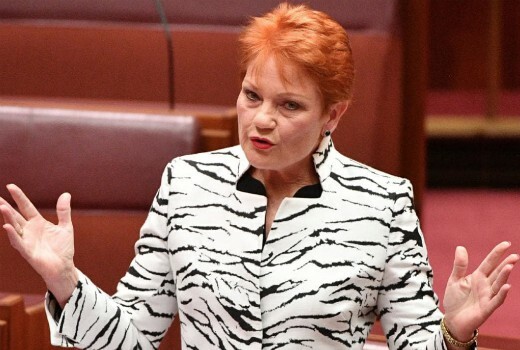 Even a ‘zebra’ costume worn by Richard Roxburgh isn’t too far off the mark of a Pauline Hanson jacket. “It’s twice we have got lucky,” Duncan suggests. There are just 2 more episodes to run before 5 seasons draw to a close. Like his central character Duncan is defiant, and unfazed by newspaper headlines. “It will be wrapping bad fish tomorrow, so it doesn’t worry me. But I’m not apologising for the show,” he insists. Rake continues 8:30pm Sunday on ABC. Still absolutely sensational television personally. I still like it even though it’s moved to politics in Canberra. I watch it for Cleaver who is hilarious no matter what he is doing. As a fan of actor Keegan Joyce, I’m missing Cleaver’s son Fuzz this season. The problem with attempting to write a comedy for the ABC about the goings-on at our nation’s capital is that what airs at 7pm will invariably be more ridiculous and far-fetched that anything Peter and his team can come up with for 8.30! I have to agree, i love Rake and have really enjoyed the journey. People seem to have a problem with change, this is why i can’t watch most american shows they have 20 episodes and go for years and it is the same over and over again! I guess the ratings and dare I say overseas sales will answer the critics and the writer, but if any example is needed then a quick look at what lasts the longest in a long list of popular British shows tells you that if it’s popular,why change things. Rumpol of the Bailey, Judge John Deed, had a good run but also kept the fans happy. I am a fan of the show, and although initially I didn’t like the idea of shifting from Sydney’s Law scene to Canberra’s Political scene, I have ended up enjoying this season and will be sad once it is finished.